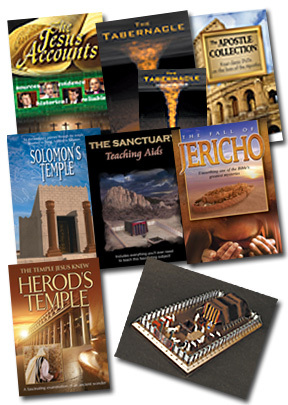 The Jesus Accounts, The Apostle Collection (Boxed set of 4 DVDs), The Tabernacle,The Tabernacle Student Workbook, Solomon's Temple, The Sanctuary Teaching Aids, Herod's Temple, The Fall of Jericho, and The Tabernacle Model Kit. This DVD demonstrates how the Jesus Accounts in the new Testament Gospels are based on solid evidence, significant ancient manuscripts, eyewitness accounts, and much more. Here is a convincing program that provides understanding and a framework to respond to those who doubt or seek to undermine the evidence for Jesus' life and ministry. The program draws on the expertise of numerous New Testament scholars and helpfully explains the background to the spread of the first manuscripts. Filmed on location in Istanbul and the UK. A great program for believers and those seeking to understand the scriptures' teaching about Jesus. Now, discover the extraordinary untold stories of the men chosen by Jesus to bring God's plan to the world. Among them are Peter, who denied Christ three times but later became a "Rock"; James and John, the fiery tempered "sons of thunder"; Matthew, the tax collector later murdered by cannibals; Simon the Zealot, the anti-Roman fanatic eventually "cut to pieces" preaching in Spain; and Judas Iscariot, whose betrayal would be paid for with silver and suicide. From their early fear and discouragement at the shock of the Crucifixion, to the final acceptance of the resurrection and their epic mission to spread the Gospel through the known world, it's an inspiring, astonishing story of the little-known men who became The Twelve Apostles. Narrated by Martin Sheen.